What are the top colleges for MBA in Tamil Nadu? Procedure and eligibility requirement for MBA sipping and port management course? Top Colleges available in this course in Tamil Nadu? Best colleges in Tamil Nadu for executive MBA? What are the difference between cat and tancet exams? MBA syllabus for TANCET entrance exam? Good colleges in Tamil Nadu for MBA? Best colleges in Tamil Nadu MBA in Airline and Airport Management? Top MBA colleges in Tamil Nadu. Eligibility criteria required for Project Management MBA? Colleges providing this course in Tamil Nadu? Details about colleges for MBA logistics and shipping management in Tamil Nadu? Am i eligible to become Technical sub inspector or Civil sub inspector of Police after completing 1 year apprentice in Tamil Nadu Electricity Board in Testing line? Re: What are the top colleges for MBA in Tamil Nadu? Here is a list of the top MBA colleges in Tamil Nadu, judged according to the quality of education imparted, faculty, tuition fee and infrastructure. LIBA – Founded n 1979, Loyola Institute of Business Administration is located in Chennai and is considered among the top ten business schools of India. It is an autonomous organization that is run by the Loyola College Society. It offers full-time MBA program (2 years), part-time MBA (3 years) and executive MBA diploma courses. GLIM – Great Lakes Institute of Management situated in Chennai was set up by Dr Bala Balachandran recently in 2004. With its excellent faculty and the aim to be at par with IIM Banaglore, GLIM has become a fast growing leading management institute. IIM Trichy – The Indian Institute of Management Tiruchirappalli is the newest addition to the IIM family. This eleventh institute of the family has been inaugurated in January 2011. Being mentored by IIM Bangalore, it will start with offering short-term executive MBA programs and will gradually move on to full time courses. PSG Institute of Management (PSGIM) – PSGIM started as a department of Management in PSG Institute of Technology in Coimbatore. However, in 1994 it became a full fledged entity having its own infrastructure and functional anatomy. The institute has state-of-the-art technology being used for imparting education and conducting examinations. Jansons School of Business – Jansons School of Business Coimbatore was founded in 2002 by TS Natarajan. It is situated in Karumathampatti; a 25 km drive from Coimbatore. It has got a modern campus, which has excellent facilities for the students. Various events and seminars are organized to give students a hand-on experience of the industry. Avinashilingam School of Management Technology – A department of Avinashilingam University, Avinashilingam School of Management Technology was started in 1994. Situated in Coimbatore, it is an all-women management school. It boasts of effective industrial network, student-friendly functional infrastructure and usage of high class educational technology to groom the aspiring women of India. Coimbatore Institute of Management and Technology – Set up in 1996 by Kovai Kalaimagal Educational Trust Coimbatore Institute of Management and Technology is AICTE approved. It focuses on the overall development of the student by imparting self-confidence, communication, leadership and assertiveness skills. It is known for having a serene atmosphere, which is highly conducive for education. GRG School of Management Studies – Established in 1993, GRGSMS is a part of the GRG Group of Educational Institutions and is located in Coimbatore. It works under the sponsorship of the GRG Trust. It is dedicated to imparting management education solely to women. It is an autonomous organization, affiliated to the Bharathiar University. VIT Business School – It is a part of the VIT University situated in Vellore and was set up in September 1994. Programs offered at VIT Business School include 2-year MBA, 2-year MBA in International Business, 5-year Integrated MBA program and 5-year Integrated BTech MBA degree. The institute works under the aegis of University of Madras. Sardar Vallabhbhai Patel International School of Textiles & Management – Founded by the Ministry of Textiles, Government of India, SVPITM is located in Coimbatore. It solely deals in Textile Management Education. Since its establishment in 2002, the college has played a crucial role in professionalizing the textile industry by giving intellectual professionals. You can apply after graduation with 50 % marks in MBA ..
BHEL Campus, Tiruchirappalli – 620 014. Myleripalayam, Coimbatore - 641 032. To get admission in Chennai based college a candiate need to take TANCET MBA entrance test. Tancet is the one of the well known test for South based college organized by Anna University for Post graduation programme in engineering & Management. Tancet Exam is being done in the month of march last year. TANCET M.Tech/ME:- 1st April, 2012. These are the top institutes in Tamil Nadu in which you can take admission in MBA. TANCET is known as MBA/MCA/M.Tech Entrance test for getting admission in south based college organized by Anna university in the month of FEB-March. 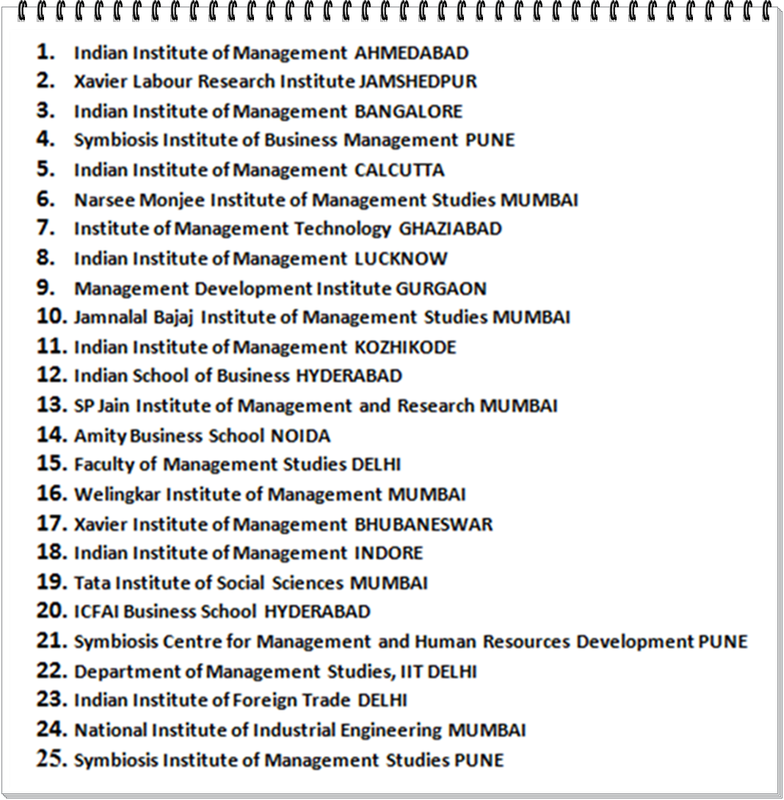 7.great lakes institutes of mgmt. 9.loyala institute of business admin. Will MBA under distance education be a good idea? Details about the distance education? After B.Pharm if I do MBA in distance education will I get a job in pharma industries? Good universities in Bangalore for MBA distance education? Which mode is good for Career part time or distance education? Which is the best choice doing MBA through distance education from Symbiosis or doing part time MBA from Welingkar ? University which is the best for MBA distance education IGNOU or AP? Does JNTU provide distance education? Procedure to do MBA Distance Education in IGNOU? When to apply for IGNOU to do MBA in distance education? All times are GMT +5.5. The time now is 10:30 PM.